Real-Time Animation, also called “Live Animation,” or “Real-Time Performance Capture,” is the process of using a motion capture system to puppet a 3D character live and in real-time. 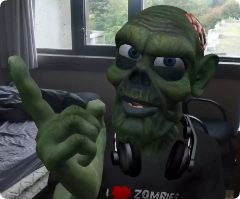 It can be used for previsualization, so a director can preview an animation while the mocap actor is performing, or as a live feed so a real person or audience can communicate with the 3D character in front of them. 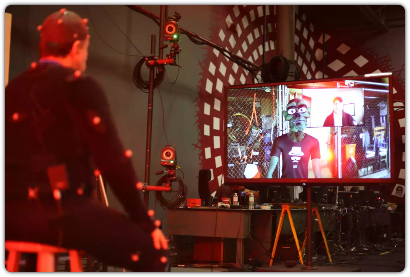 Real-time mocap animation has the ability to bring 3D characters to life and allows them to be present at game cons, appear on talk shows, speak at keynotes, and cover breaking news. Larry works with our marketing team and goes to all the conferences and trade shows that Motus attends. 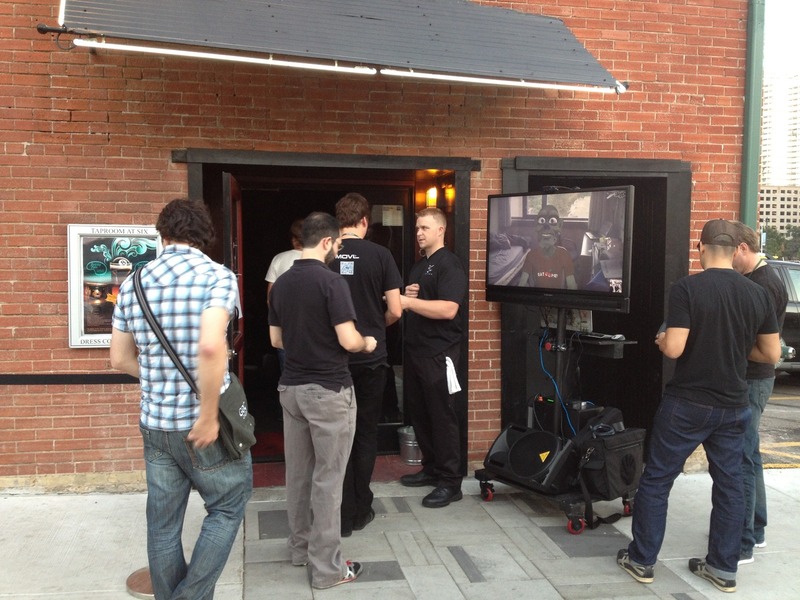 At SxSW last year, Larry spoke with show-goers at both the Gaming Expo and Interactive trade show. He interacted with thousands of attendees and maintained a larger than average crowd at the booth throughout the week, and even got a chance to meet Shaquille O’Neal. This year Larry will take our Real-Time technology to the next level by attending the show himself, in search of “The Next Big Thing”. He will interview panelists, share his schedule and report what’s going on and do whatever it takes to find the next big thing. Unlike, Elf Hotline that takes place at the “North Pole”, Larry lives in the real world and is keen on pop culture and world events. Although the Real-Time interviews will be conducted via Skype, Larry’s character will be composited into the shot giving Larry a real presence at this years South by SouthWest. 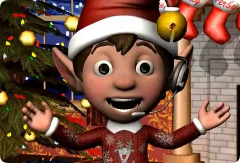 Elf Hotline is a charitable project that Motus produces each holiday season. It allows kids from around the world to Skype with a “real” Elf from the North Pole and find out if they are on Santa’s Naughty or Nice list. Parents sign their kids up by filling out a questionnaire that gives us background information about the child, allowing us to preserve the “Magic”. Santa’s always watching, right? During the call Herby sings Christmas songs, ask about their wish lists, and gives them tips to stay on Santa’s “Nice List”, which is provided by the parents. During this time, Herby, or his friend Prancer, also produce a video blog that gives updates from the North Pole, finds viral holiday videos and covers Christmas news from around the globe. The project tops off a few days before Christmas where we stream our characters to Children's Hospitals across the country. Last year we Skyped with 300+ families, recorded 200+ messages, produced over 50 video blogs and visited 4 hospitals. All of this between Thanksgiving and Christmas! Pre-Visualization is the most common use of Real-Time Animation by giving a preview of how the final animation will look. This allows the client to base their direction on the movement of the character rather than the sole performance of the actor. It also gives the actor instant feedback on how his movement and facial expressions translate to an often disproportional CG Character. The footage can be recorded and used as reference, take selections or as placeholder footage. We can also use the system to block out shots, create animatics and record camera movement for a virtual set. Real-Time Animation can also be used to create final performances which can be recorded for immediate distribution or streamed to a multitude of broadcast mediums. We can create virtual sets, run secondary animations, interact with props, drive particles, composite live feeds, insert motion graphics and much more. This means that we are not simply creating a “digital puppet show”, but driving the full system, with all it’s elements, to create a complete animated show. This is ideal for episodic content, animated video blogs, CG news reports, live webcasts, or the creation of vast amounts of animated content in very little time. Our system also enables animated characters to speak directly with it’s viewers, giving it a truly humanistic personality that people can relate and connect with. Imagine the connection you would feel if you could ask the Geico Lizard how he got into the insurance business or being introduced to the Green M&M who addresses you by name. This is the beginning of an entirely new genre of animated entertainment that will reshape the way we think of our favorite video game heroes, animated movie stars and branded characters. Applications include; Animated Late Show guests, cartoon video chats, CG interviewers, comic-con meet-n-greets, corporate appearances, stage presentations, expo communication, and live show call-ins. Create Vast Amounts of Content, Fast and at a Low Cost. ​Contact Motus if you would like to learn more about real-time animation.